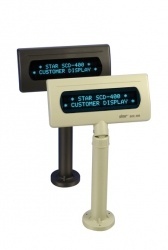 With the Star SCD400, you receive a reliable, proven and future-oriented customer display. Thanks to its bright vacuum fluorescent display (VFD), the 2x20 characters are crisply displayed in high-contrast blue/green, making them easy to read. Its wide viewing angle and character height of 9.2 mm allows the display to be read from greater distances and under difficult lighting conditions. Its height-adjustable pole allows it to adapt to its working environment, as well as its rotatable head (up to 30° vertically and 360° horizontally). The user can program 3x40 characters into the display's memory, which will then either blink or be displayed as a scroll bar. This is a convenient feature for customer greeting messages or for information during the cashier's absence. The display contains a serial connection, and can work together with a Star POS printer via a single interface. The command characters define which data the display shows, and which data the printer prints.